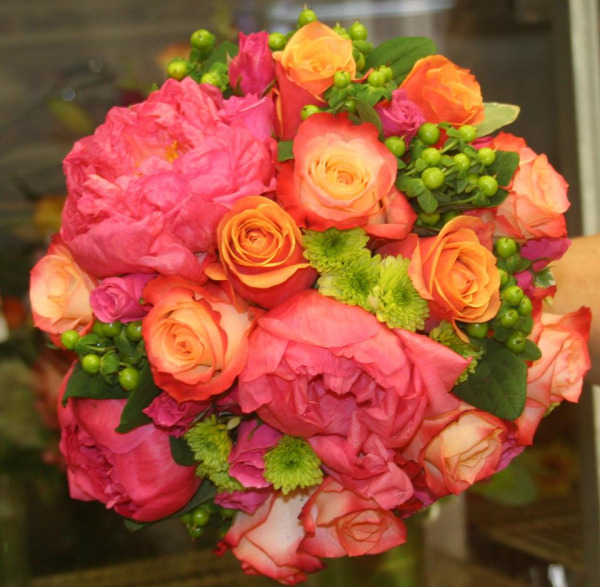 Orange is the flavor of the month and florists are incorporating this color within every square inch of their wedding planning. From bright orange to a softer peach, this interesting hue is bringing shock and awe to all, particularly to those who are attracted to the happy and bright pop of shine. Varieties that are being heavily requested are mokara orchids, cymbidiums, celosia and even some species of sunflowers, which hold the summer kissed tint. Also watch out for the re-introduction of orange lilies, which are becoming a popular bridal flower once again! Lime green is also a recurring flavor, which is being added to more and more pieces because of its property to easily contrast with several other shades as well as a perfect symbol of the summertime theme. Green hanging amaranthus is specifically one example reflecting this style and designers can’t get enough of it for high vase work and even bridal bouquets. “Black is the new red” might seem an unlikely idea but dark burgundy and purple flowers are being regarded as a high commodity right now. 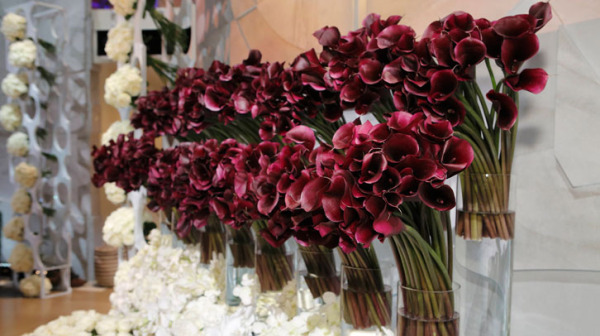 Black callas reign as the most popular crowd pleaser, especially when grouped together in mass clumps or mixed together with pure white stems of hydrangea or orchids. Yes this style is for the sophisticated but if it appeals to you, your photographer will adore your decision when shooting the black and white portraits for your wedding album. Recently, I took my five-year-old blueberry picking to one of Boston’s superb farms. He loved it because not only could he choose which berries he wanted to take home with him, he was able learn where food comes from. We collected those gorgeous sapphire spheres for an hour until our arms were full of cartons spilling over. On the way home, we happily popped dozens into our mouths for a delicious yet healthy afternoon snack. I envisioned packing baggies of blueberries for camp lunches, tossing handfuls into their morning breakfast and even possibly baking a blueberry pie. But as many of us have, my ideas were too big for what I was able to accomplish within the needed timeframe. Sure, the kids grabbed plenty out of the refrigerator when they wanted them but in the end, I just had too many to handle all at once. I couldn’t bare to witness our picking efforts wasted in the trash. There must be a way to save these juicy morsels so that we can enjoy them before rotting! Freezing berries is a technique that every New Englander should learn since our warm summer days and necessary growing temperatures are contained within only a few months. It is imperative that we use freezing as a way to utilize the fruit throughout the year which will save us money, not to mention quality in taste. If blueberries are not properly handled, there’s a high chance of disappointment when we go to thaw a freezer burned bag of tiny prunes. Follow these steps and you’ll be able to munch on your own picked blueberries long after the snow begins to fall again in New England. When you bring your fresh berries home –resist the urge to immediately wash them. Sogginess can result making them messy and squishy. Find adequate storing containers such as Tupperware that have strong lids that can defend against burning. If you don’t want to use this type of storing vessel, grab some freezer ready Ziploc bags. They work just as well and can be discarded after use. Place DRY berries in their freezing containers making sure there is as little air as possible trapped inside. Air will age the berries stealing their freshness and tart taste. Store in the freezer and allow enough time for the berries to harden. 5. When you are ready to eat them, either leave them out to naturally warm to room temperature or stick them into a colander and rinse with cool water. New England has its fair share of blizzards but lucky for us, we also get to experience the warmer side of the weather spectrum during July and August. Although temperatures in the metro Boston area commonly subside within the mid to low eighty’s, we can sometimes experience the occasional heat wave. Since most of us are more accustomed to the chillier days of the year, a day of ninety-degree weather can sometimes make us a bit uncomfortable and dare I say-anticipating January and February once again. 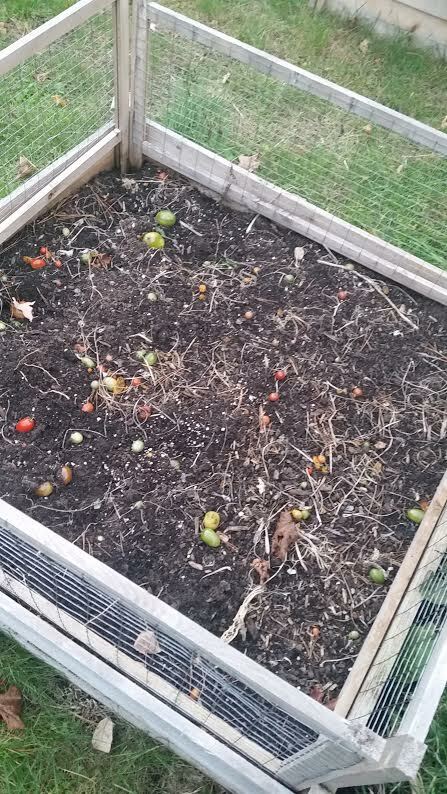 But did you know that our flower and vegetable beds crave the heat causing seedlings and fruit to germinate at a healthy rate. With the necessary watering, gardens can boom to three times the expected size during a season of muggy humidity. 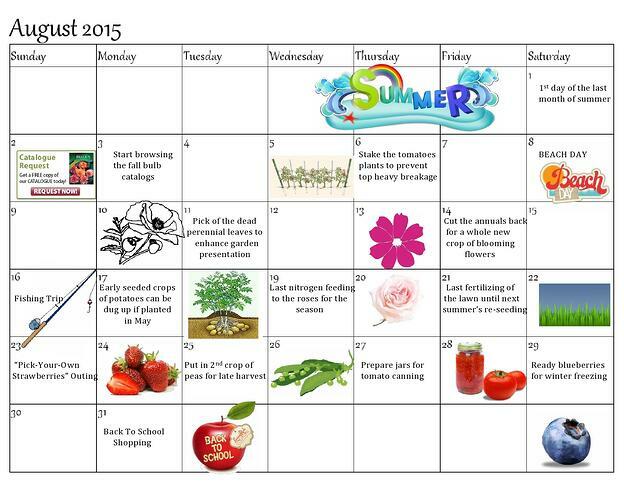 Still not sold on the importance of steamy July and August months? Take a look at these varieties that will make you thank Mother Nature for an extra fiery summer in New England! This is a fantastic flower to grow during the blazing New England summer months because it is both draught and heat resistant. They are best started by seed indoors and then can be transplanted to a regular garden once the fear of a frost has passed. When they’re ready, make sure you place them in a full-sun location since they’ll only grow taller and bigger with this type of environment. Cosmos are the #1 first choice for my garden because even if I’m having a lousy growing season, I can always depend on cosmos to be spectacular! Having the capability to re-seed itself, they can grow extremely tall so staking the stems may be necessary. Be sure not to over water and allow full sunshine to increase bud productivity. Lantana is the answer to your prayers if you have a place in your yard that has difficulty providing the right outer elements for successful growing. Craving little moisture, this fuss free plant is a knockout in the scorching temperatures and comes in a wide variety of stunning colors. Another bonus of this plant is that critters such as rabbits despise the scent so you will find it beneficial to place the flower around your vegetable crops.